Learning language is tons of fun with our unique compartment communicators. Each compartment has space for objects and frames for photos or icons. Just activate one of the colorful switch plates to turn on a light and hear your recorded message. 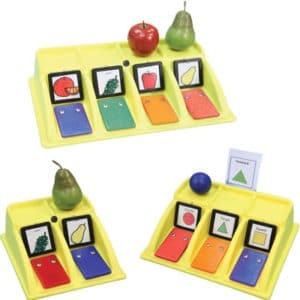 Builds skills like classification, sequencing, function, opposites and comparisons. 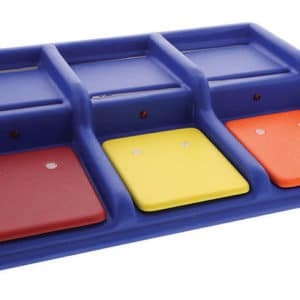 Learning language is tons of fun with our exclusive compartmentalized communicators. Each compartment has space for objects and frames for photos or icons. To view accessories for this item click accessories tab below. Our popular compartment scanning communicators are more versatile that ever, offering 2 scan modes and 12 levels. To view accessories for this item click accessories tab below. 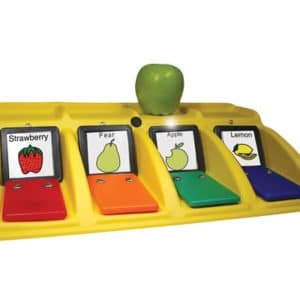 Terrific for helping learners to identify objects and their names, this communicator has platforms where objects and/or pictures of objects can be placed. 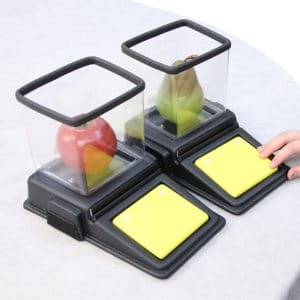 Children learn to identify and name everyday items with this practical communicator that keeps instructional teaching materials secure in the large plastic containers attached to the communicator’s raised platforms.